Six factors to consider for a successful multipurpose collaboration space. 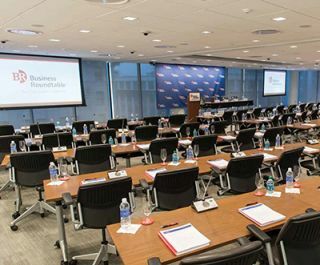 TAIDEN HCS-5300 Digital IR Wireless Conference System in a divisible multipurpose room at Business Roundtable headquarters in Washington, DC. One of the first steps toward achieving effective communication in a multipurpose room is to think of the room as a “collaboration space.” Collaboration implies two-way communication, working together to share information. This distinguishes the space’s business purpose beyond one-way “presentation,” which can be a secondary function of any space. Most collaboration spaces are designed as rooms in which technology will be added—instead of fundamentally technology-enabled rooms. Technology providers need to be represented at the design stage of new building planning and construction. Cable pathways, room layout, and location within a building relative to noisy HVAC units are only a few of the issues that are more easily (and less expensively) addressed during this stage. Location and installation of display technology—which provides the visual representation of remote participants—is not the same as putting a television in the room. Instead, the display should be large enough and oriented to give approximately the same perspective as if the remote participant were actually in the space. Rose’s CrystalView Micro LT compact extender for transmitting DVI video up to 4920 ft over fiber cabling. In commercial buildings, room designs dedicated for just one purpose are on their way out. Different types of meetings require different types of furnishings, fixtures, and equipment. 3 Make sure the room is also conducive to in-room collaboration. If a space has acoustical or visibility problems for in-room participants, they will be multiplied for far-end participants. Conversely, if the space works for local, in-room collaboration, it’s more likely to translate accurately to the far-end. Effective in-room collaboration requires attention to factors beyond obvious physical comfort. Is the room highly reverberant? Although it’s possible to achieve reasonable speech intelligibility even in reverberant spaces, the extra cognitive “processing” can be fatiguing for in-room attendees, and even more so for remote participants. Are there seating locations where sunlight or direct lighting makes it difficult to see other participants or meeting materials? While such conditions can be tolerated at the near-end, they can destroy the experience at the far-end since a camera iris doesn’t have the advantage of the human brain to compensate for lighting artifacts. 4 Remember that multipurpose means multi-user. Even rooms dedicated to a single type of activity (a gymnasium, classroom, conference room) must be designed to accommodate many different types of non-technical users. The challenge is even greater when the room itself must serve many functions. Consider the different “personas” who will be using the room and the AV technology within it. Make sure that any user interfaces are designed with an understanding of their different levels of comfort with technology. 5 Provide access to shared content. Network connectivity—wireless or wired—is a requirement for all participants in any collaboration, since relevant files, documents, and other information are often stored on servers and external drives. Also, web access can be important in many collaborative efforts, perhaps for the quick visit to a website for missing critical information. With the increasing use of mobile devices, wireless network access is assumed, as tablets, smartphones and other “bring your own device” (BYOD) endpoints show up in the collaboration space. Technologies are evolving at an ever-increasing rate, but no organization can afford to constantly update their collaboration spaces. And, as technologies are perceived to be out-of-date, they’re less likely to be used. Don’t invest too heavily in “permanent” hardware-based and hardware-bound collaboration solutions. Endpoint devices like displays, cameras, microphones, speakers are necessarily hardware-based, but fortunately these technologies are more mature and less likely to require replacement in the short term. But hardware-based infrastructure devices can constrain scalability. Software solutions and cloud-based infrastructure offers more options for meeting future scalability and collaboration needs.